"Thursday #Lunchtime Menu: L'Enfant Plaza Get you some......... PIE #foodtruck https://t.co/ILiaakopx7"
Good hearty lunch that includes a side salad. Also enjoy the Fat Tire brat pie, and chicken pot pie. I enjoyed the SMG, but prefer the other three so much more. The two desert pies I have had were also good. Excellent food and service! The BBQ pork pie is incredible. Always keeping an eye out for this truck in my area. Tried the SMOG (steak, mushroom, caramelized onion and Gruyere) this time and it was as good as expected. Again, delicious and a great value. Can't get a good lunch for less $7.50 around here. I seriously love, love, love the CPP, there is a nice portion of all white meat chicken, the sauce is perfect, not too much so you can taste all the pie is filled with. The pie crust has always been perfect as well. My mother only makes homemade pies and they are still my favorite but this is a very close second. I don't do many food trucks being I've found them to be mostly overpriced with mediocre or inadequate food. I haven't even tried other pies since I enjoy the CPP so MUCH! Sometimes sticking with a good thing is the right thing to do! Great value for the price. The pie had large chunks of white meat chicken with a creamy sauce, potatoes and peas. The crust was sturdy and didn't get soggy. I wish there was more sauce. Maybe they can serve some on the side. The slice of pot pie was served with a generous side of mixed greens and balsamic dressing. Good lunch for a reasonable price. I would definitely try again. Must first try of this truck, based on popular office chatter - was not disappointed. I got the SMOG (being partial to mushrooms), a HUGE portion, filled with very tender beef/steak, mushrooms and held together with a gruyere sauce. Toss in a salad with a balsamic dressing and you are set. All that for $7.50 makes this truck a DEAL...and a tasty one at that. Tried the vegan pie offering of the day which was veggie chile. It came with an accompanying salad which I enjoyed. The pie was good - crust was wheaty, wholeseome,dense, not too buttery, and held together well. The filling had a good taste but it was a bit too carbohydrate loaded for me - there was rice AND potatoes in there, which together with the crust made for a 3-carb meal. Note to the chefs, veggie and vegan food does not have to be overwhelmed with carbs in order to satisfy or taste good. Overall, I enjoyed the meal, and appreciated the fact that they always have a vegan option - I will try this truck again. This is my second go round with this truck. I ordered the SMOG and hated it. So as a precaution I ordered the Chicken Pot Pie and Quiche. I am unable to tell you what the spinach and goat cheese tastes like b/c I am too busy licking the box the CPP came in! It was DELICIOUS and the balsamic for the salad...AMAZINGLY TASTY! I no longer have a love/hate relationship...it's all love! The pot pie was good; filling quite tasty. Being a bit hard at the edges = a lot of crust unedible. Baltimore Bomb was quite good! A tad on the rich side, but I was expecting it. I'll be on the lookout for them in the future, and look forward to trying more of their pies - savory & sweet both! Dangerously Delicious Pies is a brick and mortar establishment located at 1339 H St Northeast, Washington, DC. 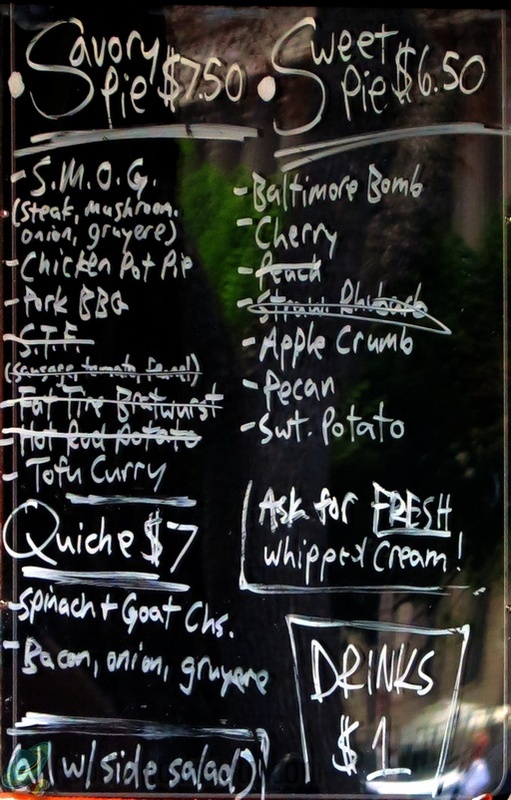 On October 21, 2010, the restaurant launched its food truck serving the same pie slices that can be found in the restaurant. Dangerously Delicious Pies is the first DC restaurant to spawn off a food truck. Pies are both sweet and savory, including a BBQ pulled-pork pie! 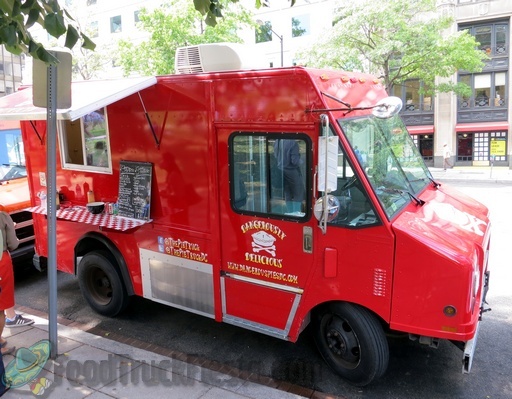 Their truck re-launched on July 9, 2011 using the twitter username ThePieTruckDC and featured a new red base color. The first generation truck became the Cajunator food truck.